Results highlight management of the two distinct periods of off-site movement of herbicides for canefarmers; one during the dry-season (April-November) when irrigation drives off-paddock pesticide loss and the second during the wet-season (December-March) when significant rainfall typically occurs. While irrigation runoff losses can be significant, canegrowers can exert much greater management control during the dry season compared to large wet season events through controlling the duration of irrigation events and/or capturing irrigation tail water. Management options during the high risk period leading into the wet season are limited but options such as banded applications, reducing the amount of product applied and using products with lower residual capacity or low non-target toxicity can result in water quality benefits. 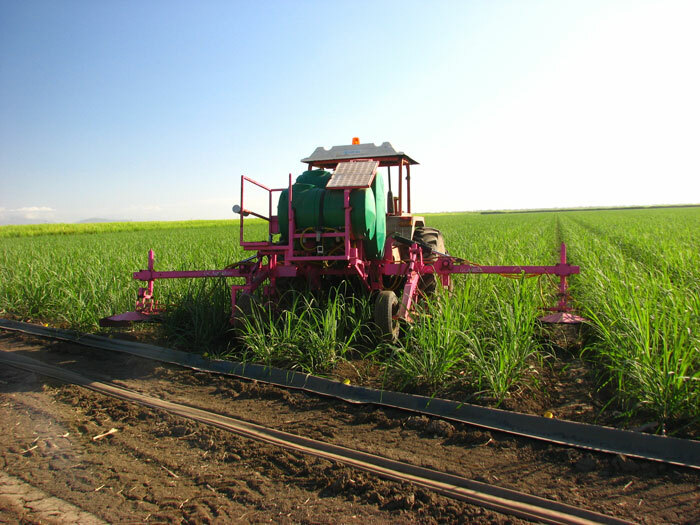 Weeds are a major contributing factor to losses in both production and profits for the sugarcane industry. When grown under optimal conditions, they compete with the sugarcane for vital nutrients and access to water. Herbicides are used to control weeds. However, there are concerns about chemicals including herbicides being transported to the Great Barrier Reef. The photosystem inhibiting (PSII) residual herbicides are of greatest concern due to their potential to affect algae, seagrasses and coral. The objective of this project is to monitor the agronomics and surface runoff water quality for typical industry endorsed best (B class) practices for the region. The site is located on a Queensland Department of Agriculture, Fisheries and Forestry demonstration farm. The 6.6 hectare trial site is located on a low permeability ‘heavy barratta clay.’ This soil type represents 25 to 30 per cent of the region’s cane land. The trial site has implemented principles of the sugar industry’s ‘New Farming System’ including controlled traffic with GPS guidance and minimum tillage. Crop inputs have been optimised through nutrient rates determined by Six Easy Steps. A range of hydrological, agronomic and water quality parameters are monitored. Rainfall for the 2010-2011 season was 1475 millimetres, much greater than the long term average of 855 millimetres. This resulted in the need for only two (0.85 and 0.76 megalitres per hectare) of the eight to 15 irrigations usually applied in a year. The trial grower has implemented a long-term weed management strategy based on effective control of weeds in fallow periods and early crop stages through monitoring of weed pressure, appropriate timing of herbicide application and suitable chemical selection and application. This has facilitated a shift away from ‘residual’ herbicide control in early crop stages to a reliance on contact (‘knockdown’) herbicides in ratoon crops, with significant reductions of residual PSII herbicides leaving paddocks through the crop cycle. Residual herbicides (atrazine, diuron, hexazinone) were used to control weeds in the 2009 plant crop. Runoff losses of these products in subsequent irrigations ranged between two and five per cent of the amount applied (three to 20 grams per hectare), but were entirely retained on-farm through use of tailwater recycle pits. By the time major wet season rainfall occurred, herbicide loads in paddock run-off had diminished to less than 0.01 per cent of the product applied. Following effective weed control in the plant crop, and minimal subsequent weed pressure, herbicide application during the November 2010 post-harvest period was limited to a shielded spray of 2,4-D onto the cane-row and glyphosate and 2,4-D onto the furrow. Weed pressure within the monitored block was so low that this mixture was only applied in patches where weeds were present, with only five to 10 per cent of the block treated with herbicide. Even with unseasonably high early wet season rainfall occurring soon after application, losses were limited to comparatively minor loads (approximately one gram per hectare) of glyphosate and 2,4-D over a major wet season. The average cane yield over the 2009, 2010 and 2011 years varied between 100 and 140 tonnes per hectare. The actual yields harvested over the three years were within, and at the higher end, of the average range for each crop class based on the grower's historical yields. The table below shows the herbicides applied, application dates, irrigation runoff loads, rainfall runoff loads and proportionate losses of product applied for the Burdekin sugarcane case study trial site in 2009–2010. * Denotes grams of active ingredient per hectare. Image: Paddock to Reef grower applying herbicides with a shielded sprayer. Photographer: Rob Milla. Aaron Davis (TropWater) and Rob Milla (Queensland Government Department of Agriculture, Fisheries and Forestry).